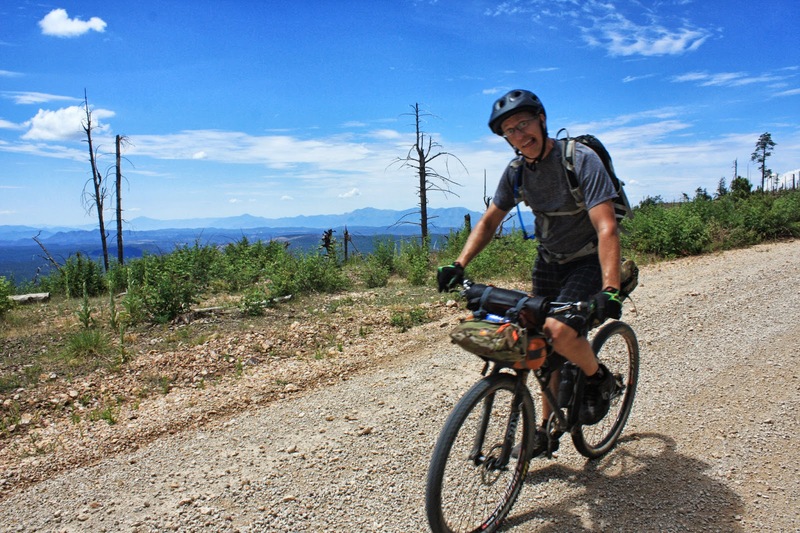 Shortly after blogging about our rides up on Montana Mtn & Whitford Canyon, Ray made mention that we should create a new AES race out by Picketpost to replace the defunct Black Canyon Trail race. A few days later I emailed Ray & Jeff a couple of routes for consideration. We dubbed thee Punisher (50 miler) & Pulverizer (81 miler). I really wanted to check out the lower portion of the Punisher loop, a 21 mile loop circumnavigating Picketpost Mtn. 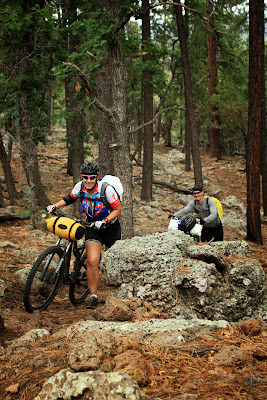 We'd start on the AZT heading north, pickup the Legends of Superior Trail (L.O.S.T. ), then onto Telegraph Canyon (FR4) and finally finish with the AZT back to the car. Easy enough. 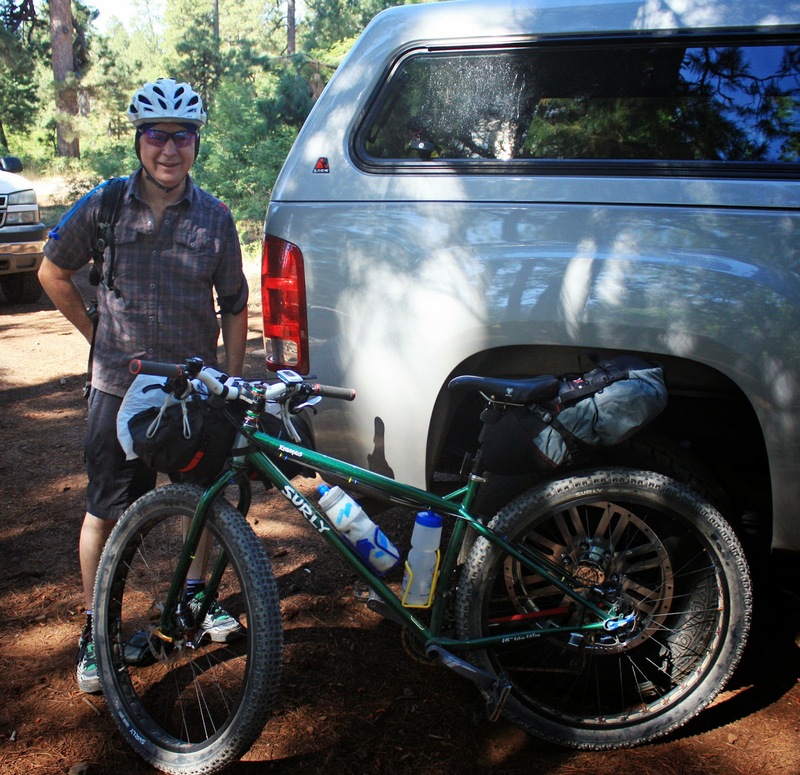 Jeff, Nancy and I met out at the trailhead in the semi-cool of 6am. Our main mission on this day was to scout for water sources for the racers. 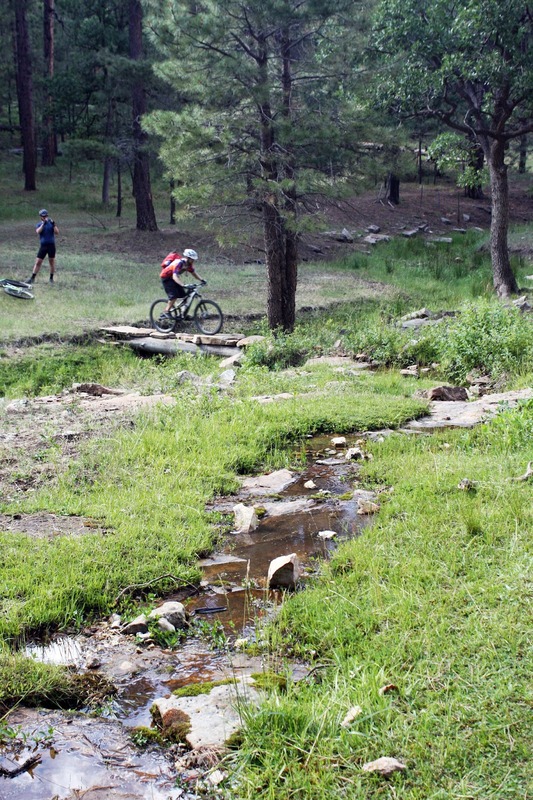 The race will begin with a 2 mile neutral start through the AZT singletrack to a clearing next to the railroad tracks. The green flag & race clock will start there. 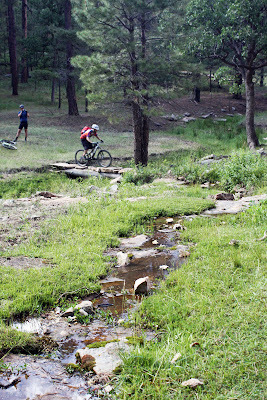 We made our way onto the backend of the 50 mile course and the LOST. 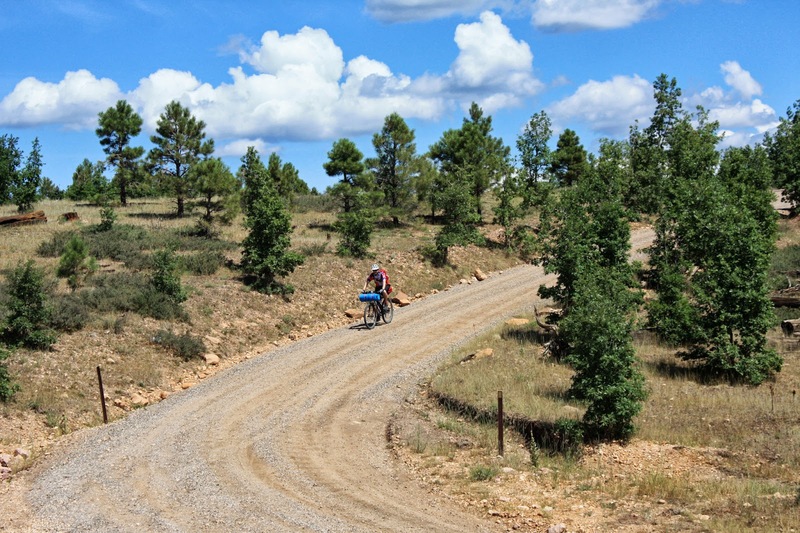 Almost immediately we came to a couple of tricky turnoffs, the trail meanders back and forth between singletrack and dirt road. While signed, it is very easy to blow by a turn or two as we were guilty of this on several occasions (we had the track loaded on 2 GPS's as well!!). 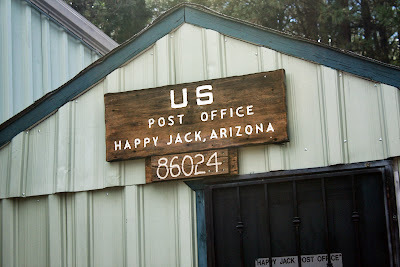 We went under US60 and soon arrived here, a desert oasis!! Look at all the water!! 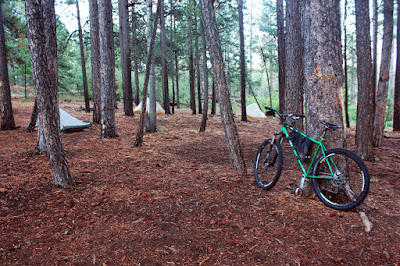 Nice camping spot...when not raining. While beautiful, this watering hole probably won't be around for race day in early Nov. The LOST dumped us onto US60 about a 1/2 mile west of Superior. 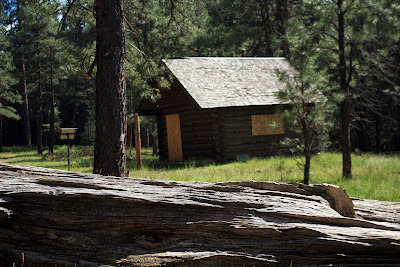 As we approached the turnoff for Telegraph Canyon we spotted a newer looking building across the street. As luck would have it the Superior Clinic has 3 hose bibs on the outside if needed. A short 1/4 mile off-route into town is a cafe. Another 1/2 mile down the road lands you at Los Hermanos and Circle K next door. Plenty of food/drink options for both during and after the race! Clinic with working hose bibs. We started south onto Telegraph Canyon, spotting the public pool which looked mighty tempting to scale the fence and jump in. We rode over to the pool area in search of a Coke machine, instead we found the Superior skate park!! No bikes allowed, but no one was around so we played on the transitions a bit before moving on. The pavement lasted a bit longer than I thought it would, but eventually turned to dirt and began to climb. We arrived at a three-way split and stayed far left on the main road, not so fast - 'off route'!! Back to the junction and onto the least traveled of the 3 options in true AES fashion. What a sight!! Ocotillo forest. Guns a blazin' out here. As the road turned up the riding became increasingly difficult over the loose, chunky surface. We all agreed, this was no forest road!! Perhaps a 4x4 route. 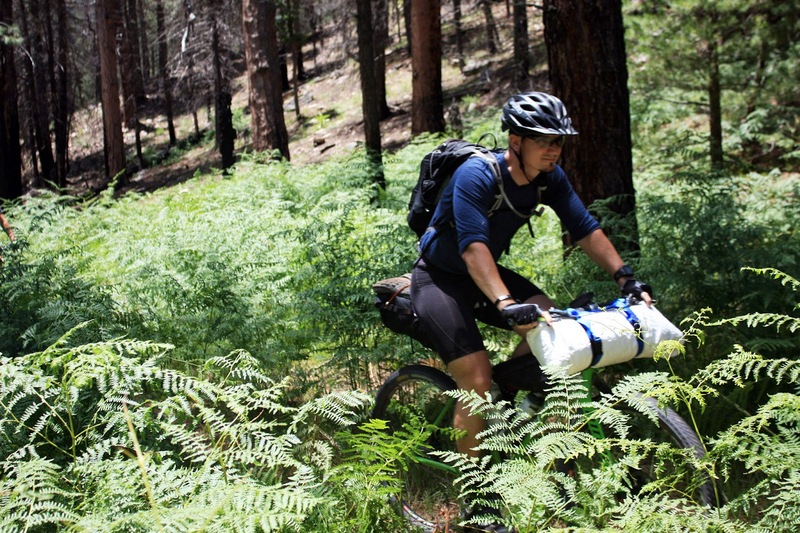 It was giving me flashbacks to the jeep roads following the Redington Rd climb during the AZT300. For me, not the most pleasant memories. The climbs weren't that long, just energy sucking, at least during the race it won't be pushing 95º. 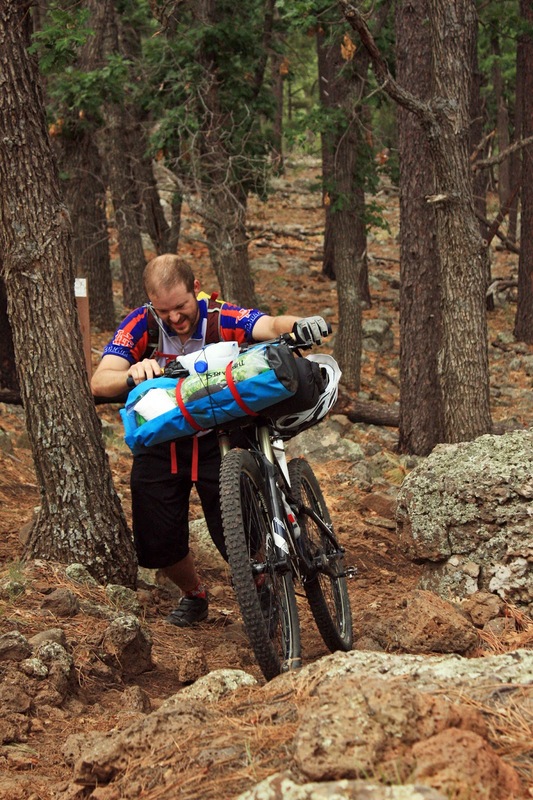 For every chunky up, there was an equally chunky downhill. 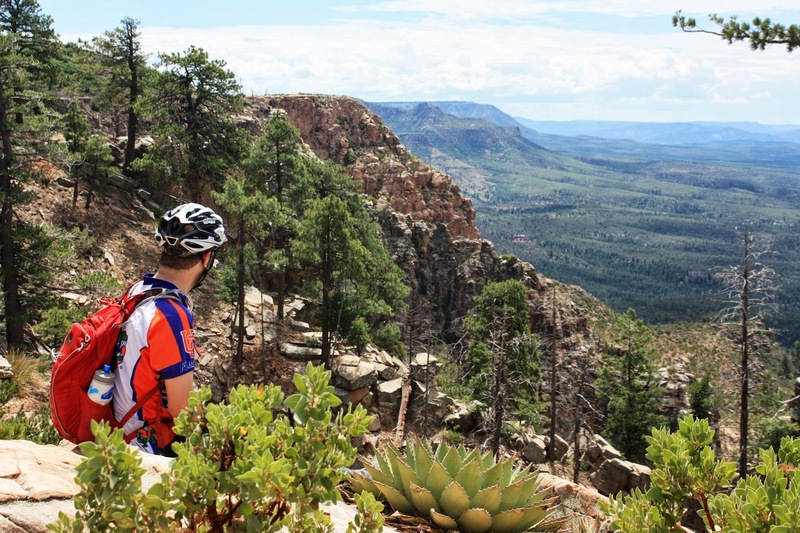 The ride up to the AZT turnoff was a grunt, but doable and very scenic. This was one of the 'smoother' climbs. Mmmmmm chocolate milk at Trough Springs. 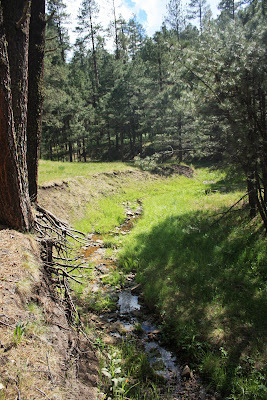 As we neared the AZT junction I wanted to finally locate Trough Springs. I had a waypoint marked, so we went on the hunt. The tank was full of water, muddy stagnant water. If needed, it'll save your life - bring a filter!! This was the first time all 3 of us had been back to this section of AZT since the 300. 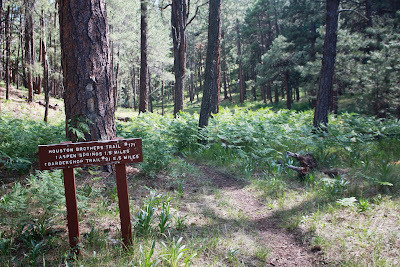 I had so many thoughts and memories come flooding back as we wound our way down the 7+ miles of trail. I missed my photo op of Jeff & Nancy during the 300, so I grabbed a couple shots of them crossing the finish line on this day. 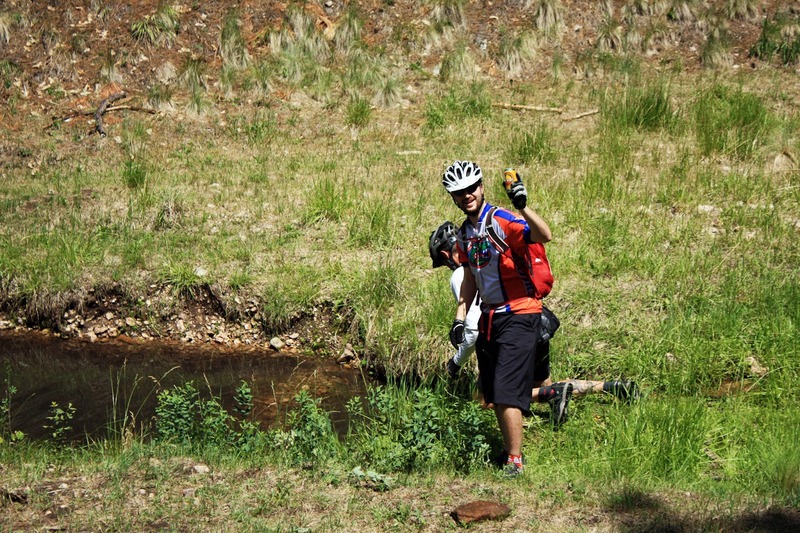 This trail will put a smile on anyone's face!! Can you spot Nancy on the hillside?? Nancy was the 1st female singlespeeder to finish the 300!! Rockstar. We ended up with 24 miles after our side trips. 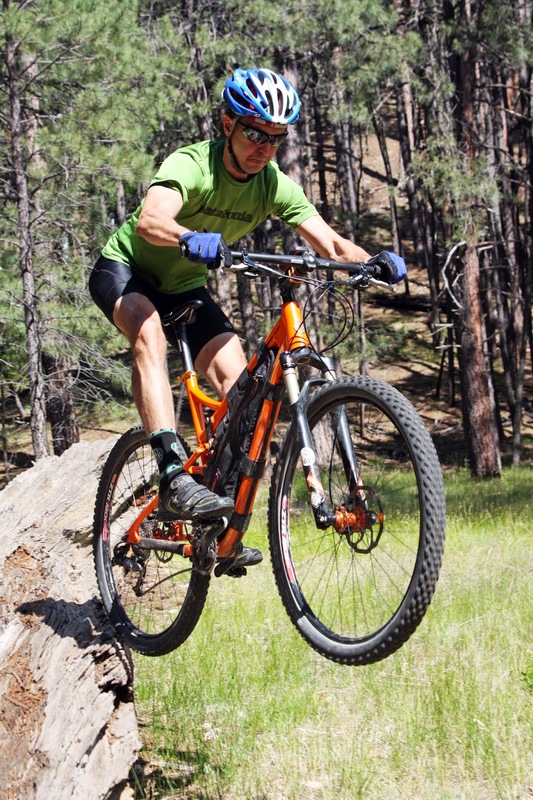 It's probably a good idea for anyone new to the AES scene to come on out and pre-ride this lower loop, get some practice using a GPS before November. It'll help ease any confusion with the route on race day. Don't end up with a DNF because of a few missed turns!! 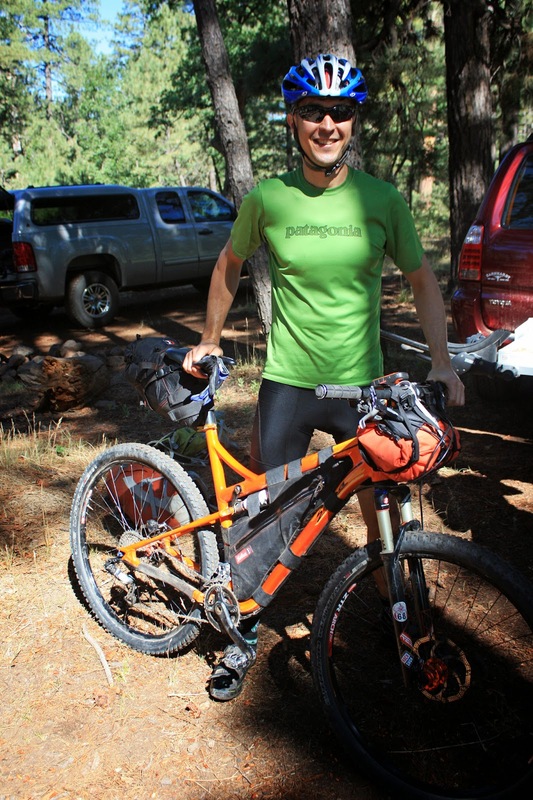 Bikepacking is really starting to gain in popularity. It seems like more and more riders are interested in what it has to offer, but often times are afraid to pull the plug on that first outing. 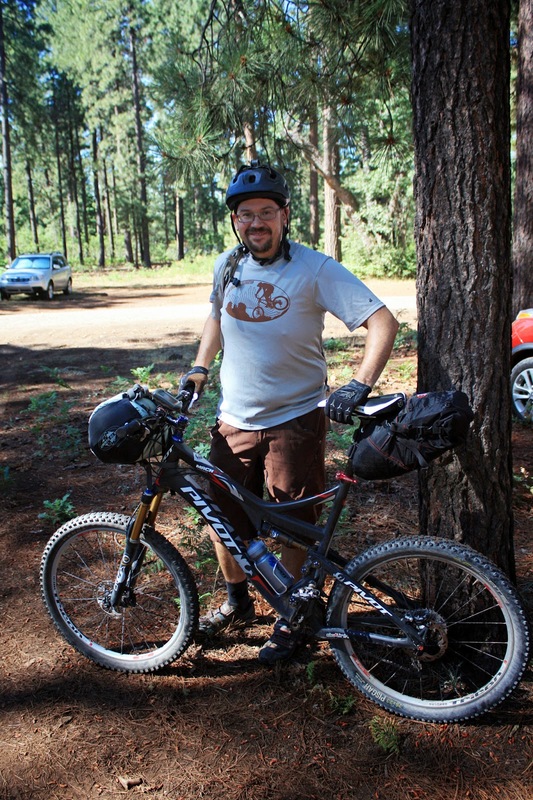 Brian, Bob and I tossed around the idea of hosting a bikepacking ride aimed at getting first-timers out on the trail. 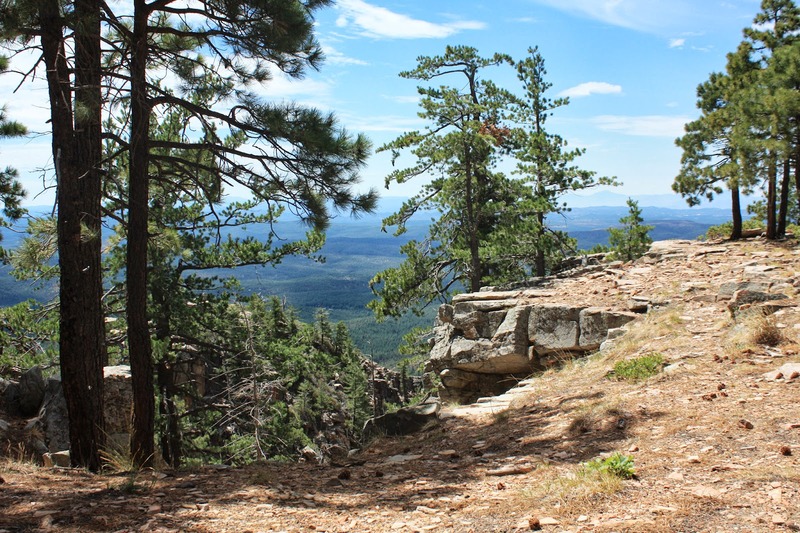 We thought the trails up on the Mogollon Rim, north of Payson, would provide just what we were looking for. 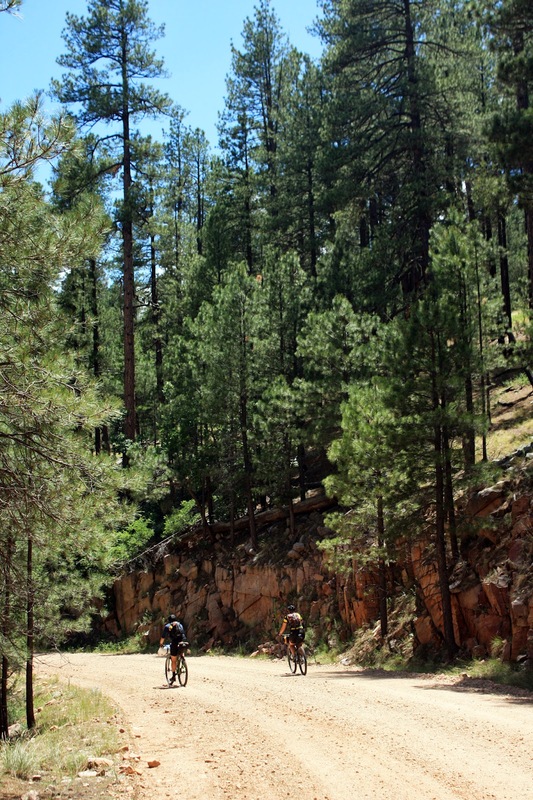 Great views, a mix of forest roads, singletrack and solitude. Cool temps wouldn't hurt either!! Brian was getting swamped at work, so I poured over some of my GPX files and put together a route with some different exit options for day 2. 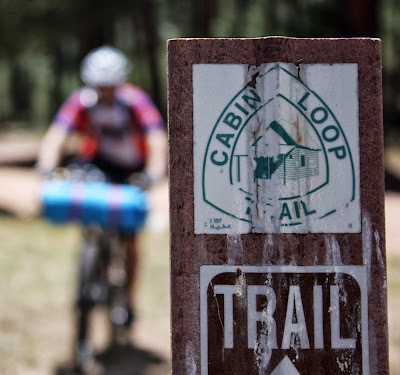 In general we'd be riding the rim rd, FR300, east to the Cabin Loop system, camp there, then return either the same way or some other combination of Arizona Trail / Forest Rds. We spread the invite to any and all who wanted in, the response was very good and by the time we lined up for takeoff there were 10 riders, 9 of which would do the full bikepack. 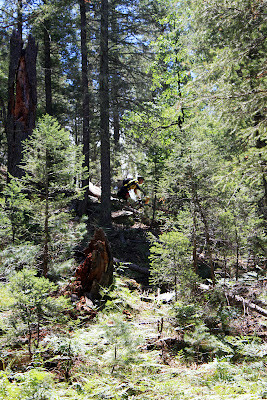 Brian and Bob took Friday off work and were up on the rim early scoping out the area for a better camping spot. I took off just before 4p as soon as I posted the updated camping coordinates for anyone else who was joining in Friday. The entire way north I was on the tail of a rather large thunderhead, but my windshield escaped...still dry as a bone. 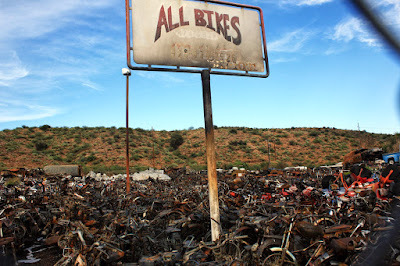 Sad to see, this eclectic collection of bikes in Rye, AZ burned to the ground a few weeks ago. Our camping spot for Friday evening, close to the rim's edge. 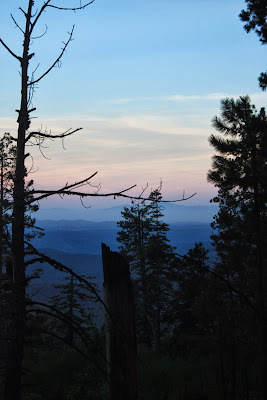 Friday's twilight had a Smoky Mountain feel to it. Friday evening was absolutely beautiful, temps were in the 50's under a starry sky. Dave and Doug met up with us just as darkness fell. The next morning we had plenty of time to eat breakfast and pack up camp before heading the 2+ miles back to our meetup point for the rest of the group. By 9am we were just about ready to get rolling. I went around and took pics of everyone's setup. Doug ready for a nice out-n-back ride. Dave had tons of gear, but some cool methods for attaching stuff. 1st time bikepacking. Arturo winning friends the old fashioned way...DONUTS!! 1st time bikepacking. 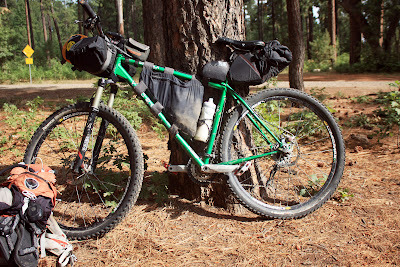 Bob and his slick Spearfish with Revelate framebag. 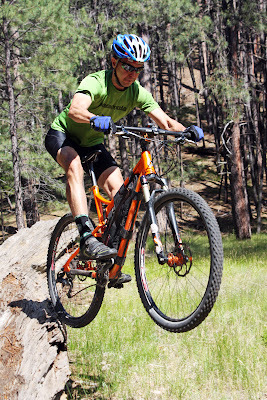 Brett rockin' the belt drive singlespeed!! 1st time bikepacking. Brian and his hometown Pivot. Stylin' the Voodoo per usual. This bike has seen some things. Alan and his 'don't call me fat' Krampus! 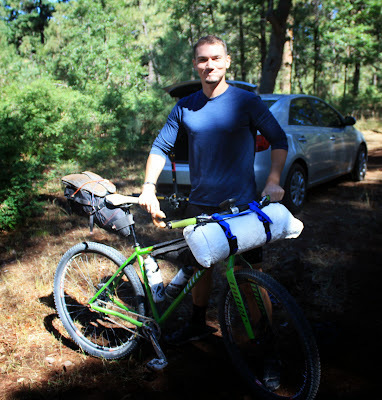 1st time bikepacking. 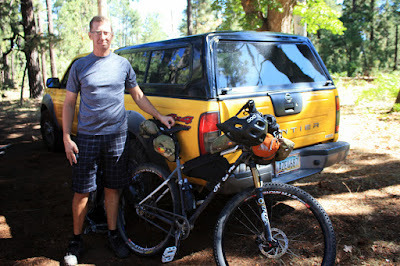 Another singlespeeder, Tim, with his über light Niner. 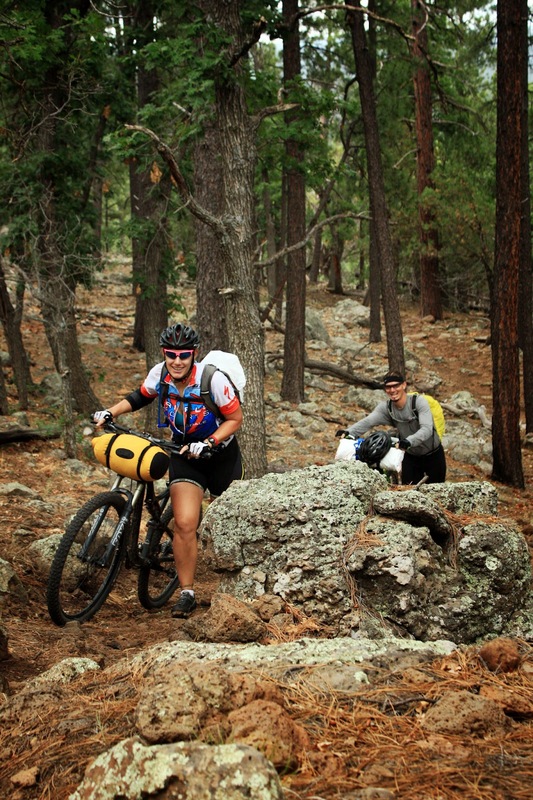 Ashley traded in her roadbike for a bikepacking experience!! Our route started at the FR300/FR218A split just off AZ87. It's a fairly mellow cruise among the pines, some ups, some downs, but nothing crazy steep. A few miles into the ride a couple of brazen chipmunks tried playing Frogger with the group. The first fella made it across the freeway, the second guy was clipped by Ashley's rear wheel and did a double somersault before sticking the landing and bolting into the forest!! It was quite the acrobatic display that unfolded in front of me, if only I had a GoPro at that moment!! Rolling down FR218A. Photo by Dave. Bob and Brian thinking of a beer stash ahead. Photo by Tim. Arturo cruising into the first overlook area. Trees & views for miles. Photo by Doug. 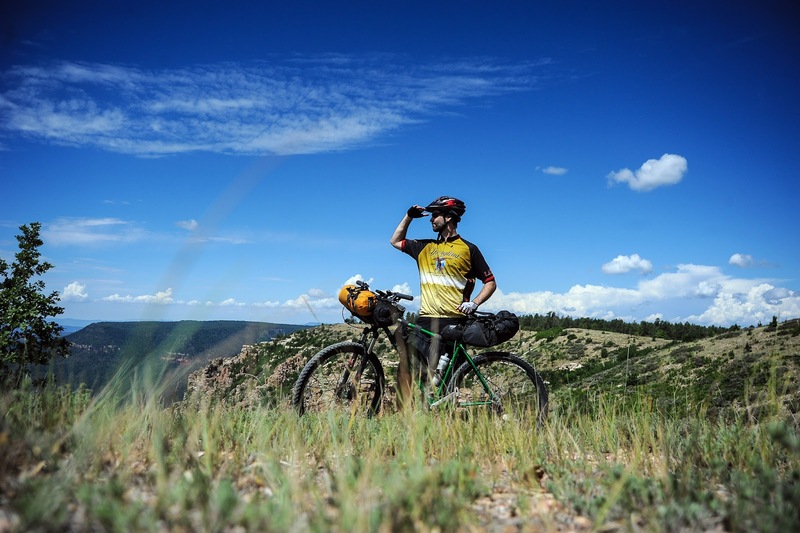 We continued our trek east on FR300, stopping a few times to check out the wonderful views. There was hardly any traffic on the rim road too, so that was a nice bonus. Arturo soaking up the views. Brett could hardly contain himself! Gliding for hours on the thermals. A couple of hours into the ride we arrived at the AZT junction and the start of the Cabin Loops. 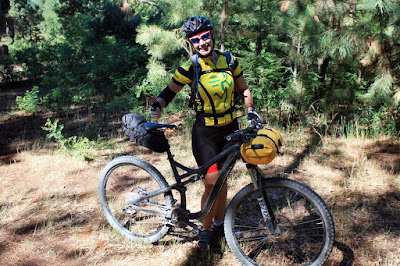 Singletrack!! We took a short snack break then headed north to the land of ferns. 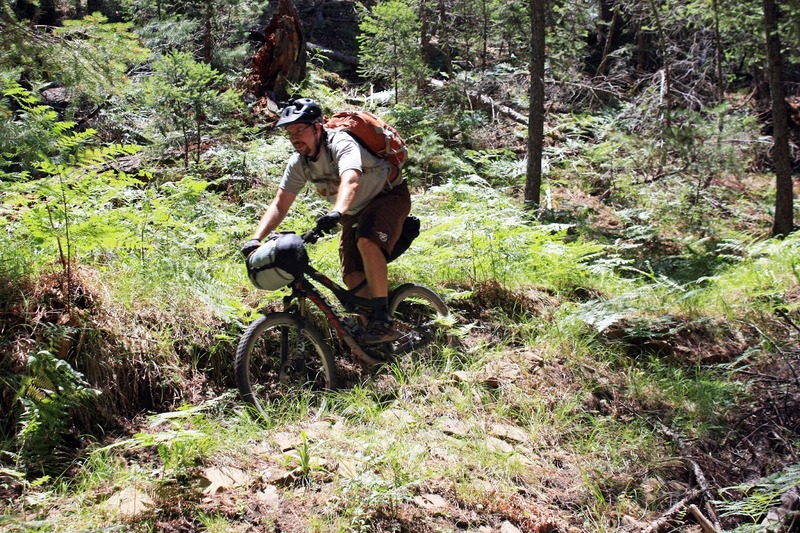 Brian making his way down the Fred Haught trail. A glimpse through the trees. Tim staying focused on the trail. Shoulder high ferns kept us guessing the trails path sometimes. 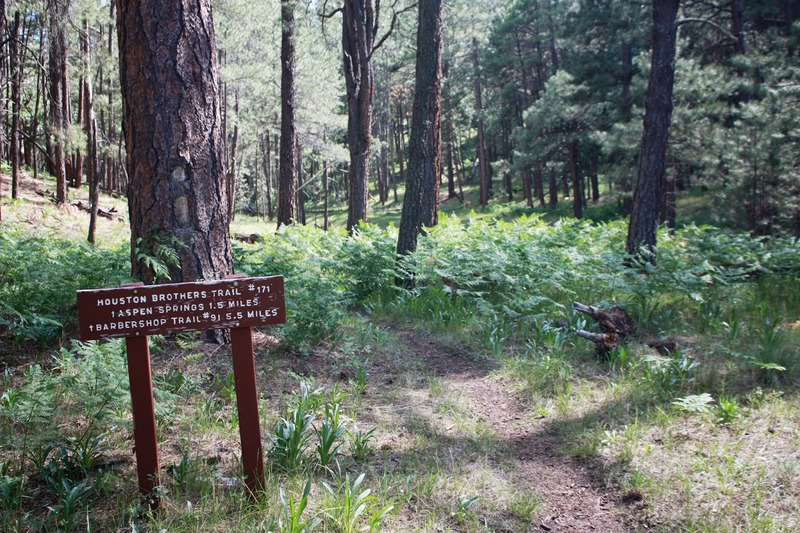 I'm not sure why people don't frequent these trails. We had almost reached our camping destination at Pinchot Cabin, but there was one stop we had to make. Brian and Bob came up with a brilliant idea to stash some beer/gatorade/water under some rocks in the small creek near camp. We kept it a secret until we showed up, making the others dig out their beverage of choice from the cool waters. It seemed to go over quite well!! Brett's belt drive singlespeed. Macho. Photo by Arturo. Earlier on the ride we yo-yo'd with a small group of hikers who were on their way to Aspen Spring to camp, we joked with them about racing to the camping spot. 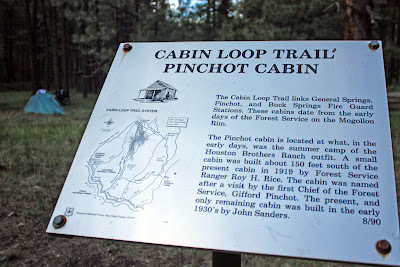 They were a bit relieved to find out we were camping about a mile down the trail at Pinchot Cabin. 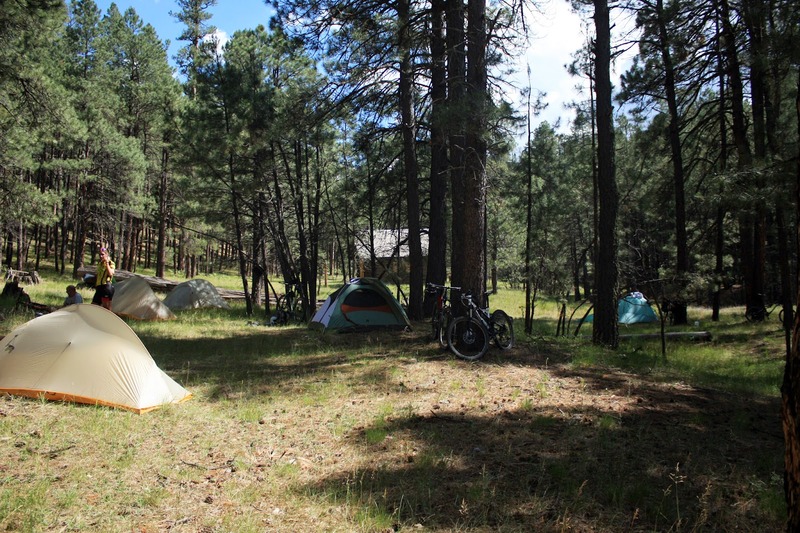 We rolled into camp, picked out our tent sites and set up camp. 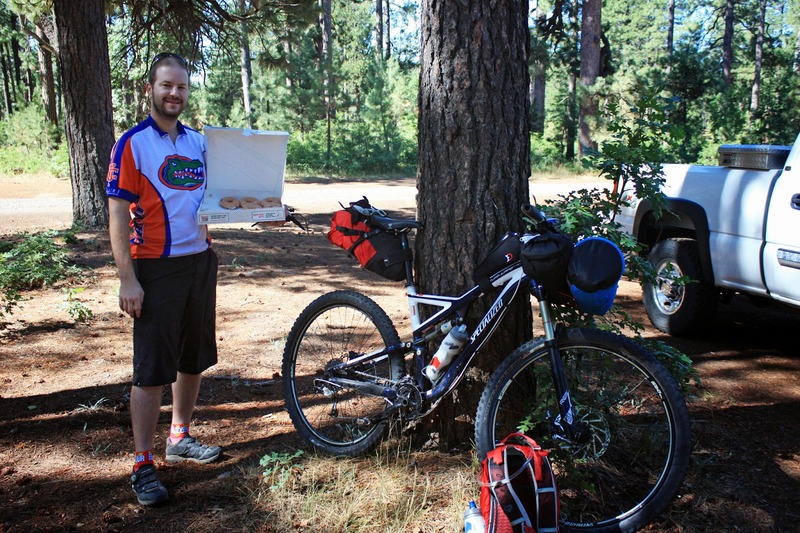 We also ditched our bikepacking gear before continuing onto the Houston Brothers trail for an 8 mile out-n-back ride. 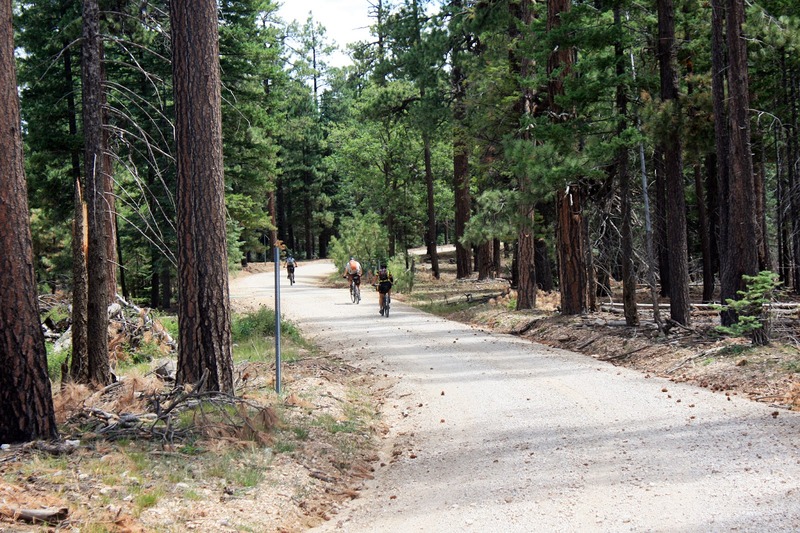 Four miles of gentle climbing then four miles of ear-to-ear grinning descending back to camp!! 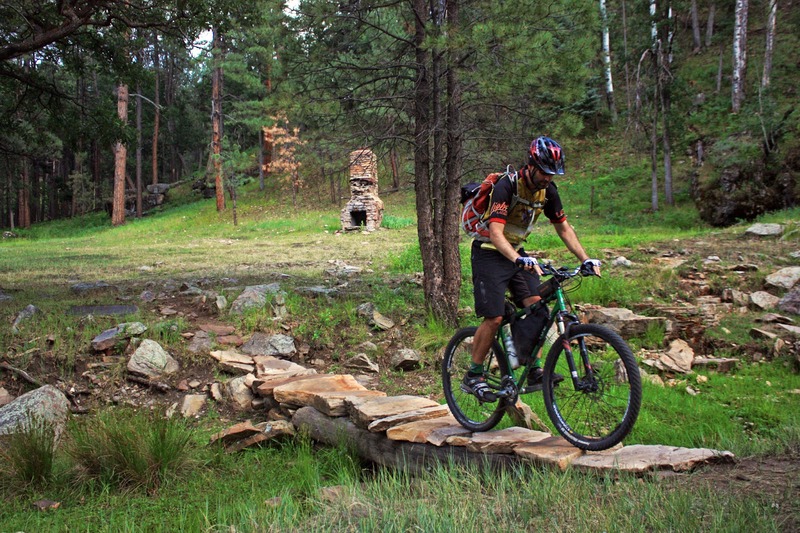 Start of the Houston Brothers trail. Nice water source for filtering. Bob exiting his log ride. Cool animation that Picasa threw together for me. 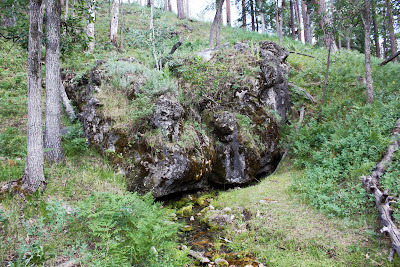 Crossing Aspen Spring. Arturo on the rock bridge. 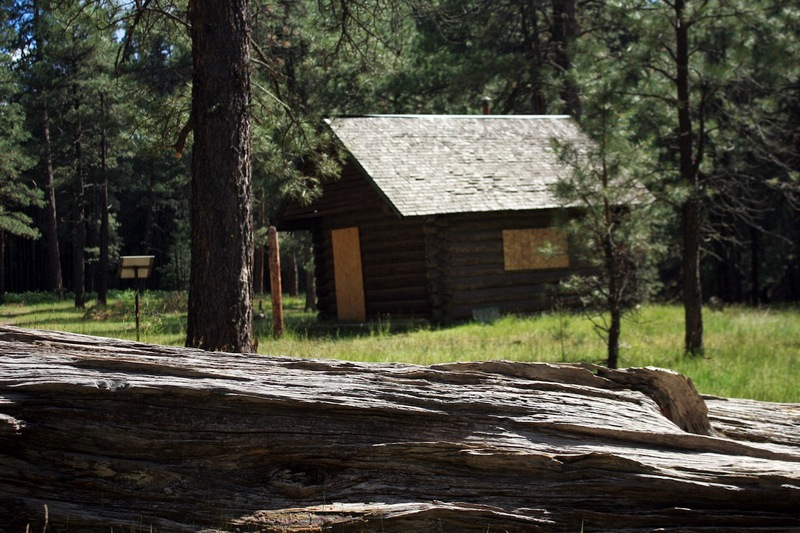 Remnants of Aspen Spring cabin. Photo by Tim. While on Houston Brothers the clouds began to darken, we knew what was coming. Back at camp a bunch of us started filtering water for the evening when the first raindrops fell. 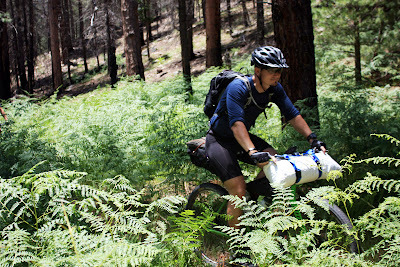 I was glad to finally be able to use my filter on one of these bikepacking trips, it worked quite well with the slow running creek. The rain picked up and most of us took refuge in our tents. My tent in particular, a Tarpent Contrail, isn't exactly waterproof, but I knew that when I bought it. Just above the floor tray the tent has about 8" of mesh before the upper canopy. The rain was now dumping in buckets and I needed to help prop the ceiling up to aid in drainage, but for the most part the water stayed outside. We also had a bit of hail mixed in for good measure. I could hear Tim outside running around and having a blast in the rain. The rain event lasted about 25 minutes, then it was time to cook up some dinner. I made a few adjustments to the tent then prepared my warm meal for the evening. Lonely bike in the woods. Photo by Arturo. Tyvek Man!! Photo by Arturo. Cooking up a gormet feast. Photo by Arturo. Dinner time on the Pinchot Cabin porch. Photo by Tim. Four aspen trees tucked into the forest. Photo by Tim. 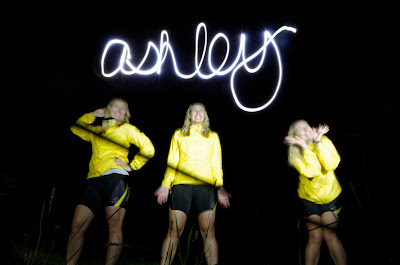 Light painting fun with Ashley. Photo by Tim. 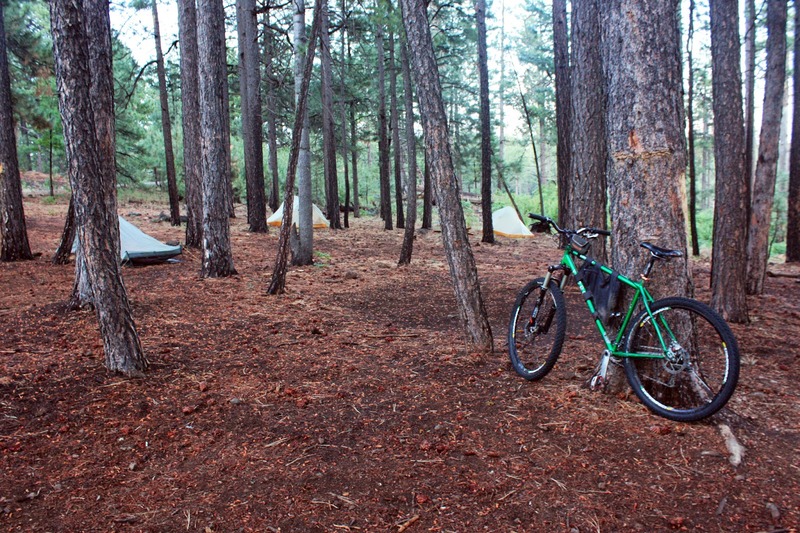 Bikepackers by LED. Photo by Tim. We crashed out around 9pm and I was able to get a good nights sleep. The next morning we were stirring shortly after daybreak. It was overcast & muggy, but cool. I think we all had a feeling that we'd be riding in the rain on this day. We ate breakfast, packed up camp and started back around 9:30a. 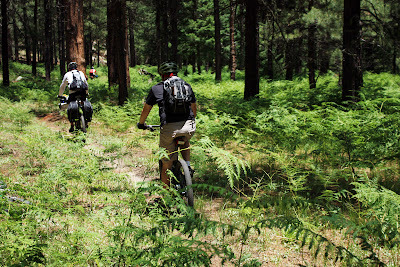 We took a short forest road option around a HAB section of trail with a couple of the guys opting to stay on the forest roads all the way back. 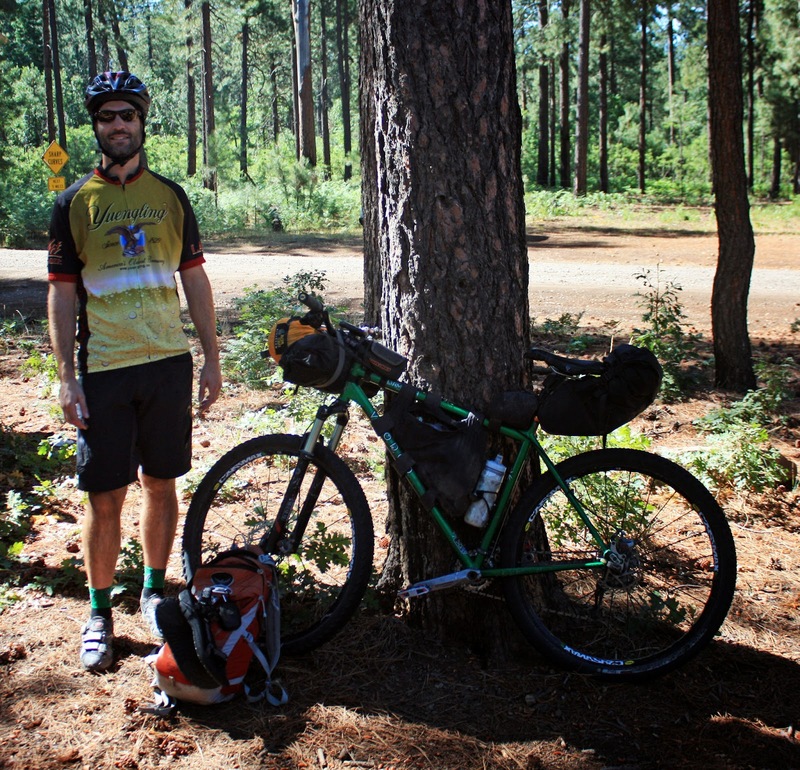 The rest of us continued on to the junction with the AZT. From there Arturo, Tim, Ashley and myself opted for the AZT option while the others took the trail back out to FR300 for the return. 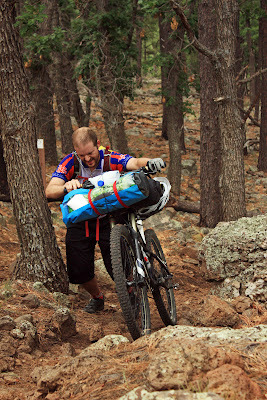 Brett mashing up a climb. Photo by Arturo. The gang heading out. Photo by Arturo. 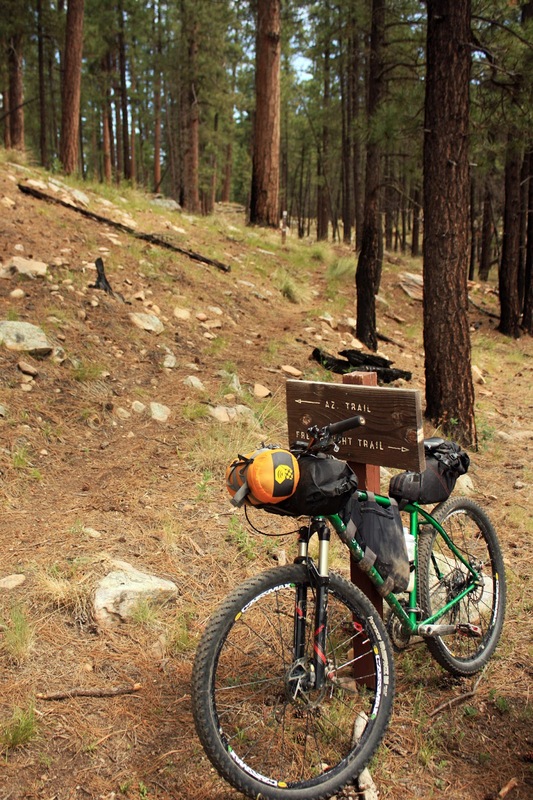 AZT junction with the Fred Haught trail. 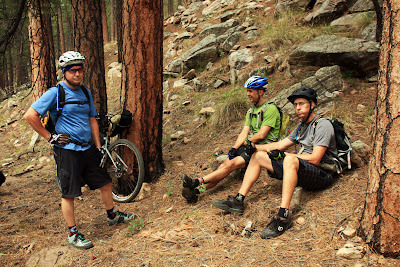 Alan, Bob & Brett deciding which way to go. The first of two sustained HAB sections. Photo by Arturo. The HAB gave way to some nice singletrack and a bit of forest road. 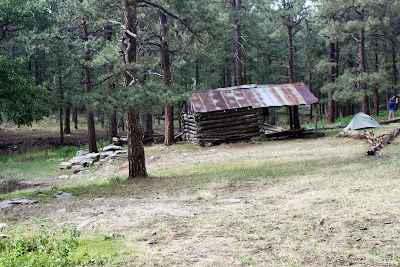 The others didn't seem to mind that HAB section, why not see if they want to stay on the AZT all the way out to AZ87? 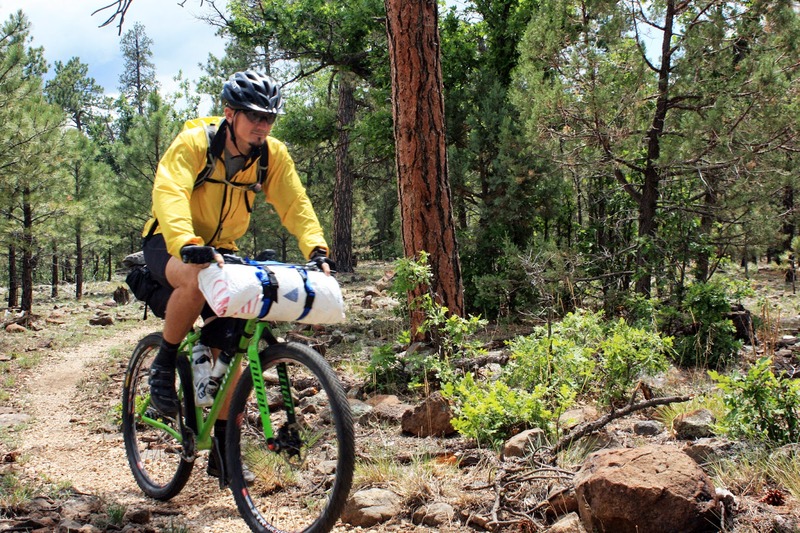 This option would give us more singletrack, the entire Blue Ridge Passage #27 of the AZT and we'd then finish on rolling pavement back to the cars. 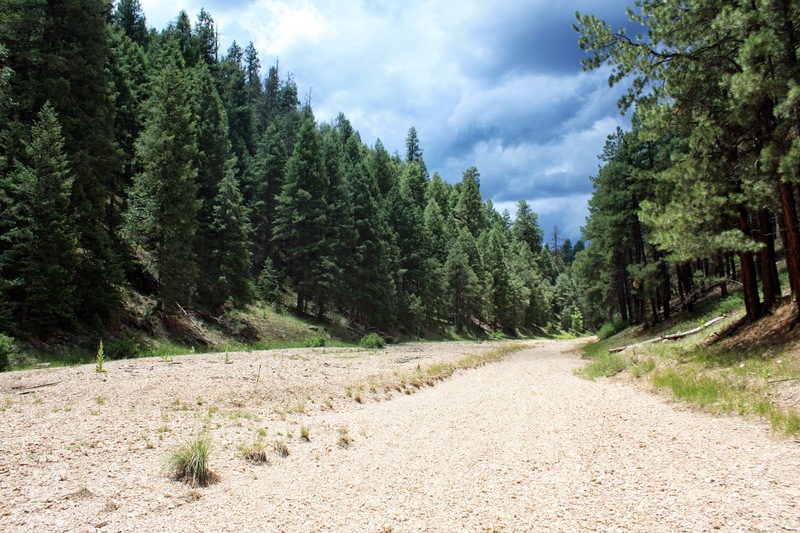 I presented the option with the caveat of the second more daunting HAB out of Blue Ridge reservoir. The others quickly agreed. We soon made our arrival at the bottom of the dry creek bed below the reservoir for lunch, storm clouds brewing the entire way. What?!?! 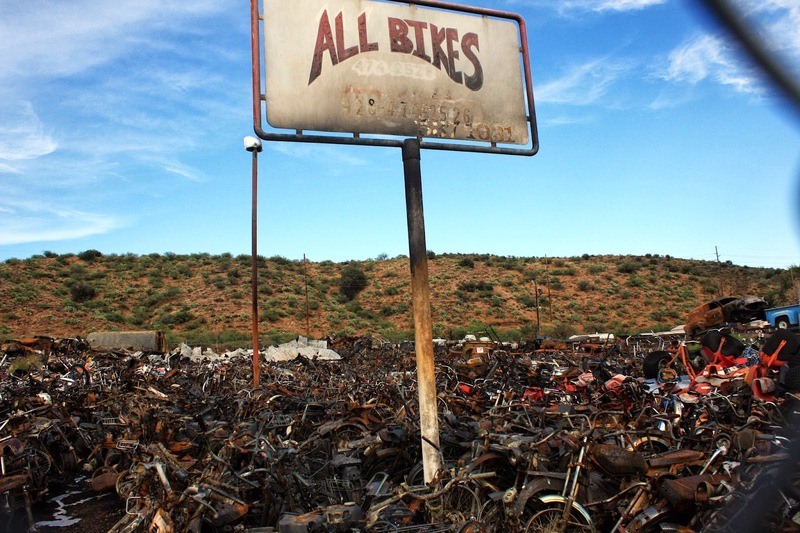 No mountain biker on the sign!! Ominous storm clouds nearby all afternoon. See, everyone enjoys a good HAB session once in a while! I was perched at the top of the HAB enjoying the show. Photo by Arturo. You are here, smack dab in the middle of Arizona. High meadow crossing. Photo by Arturo. 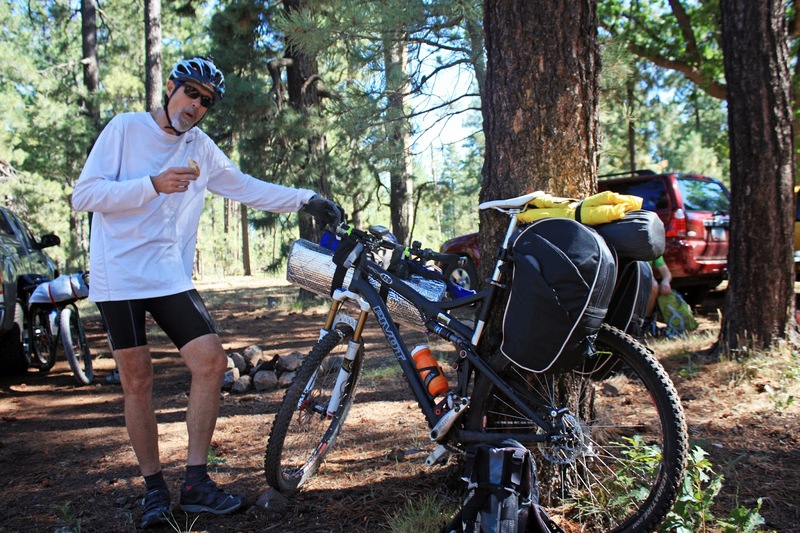 Tim enjoying another slice of AZT. 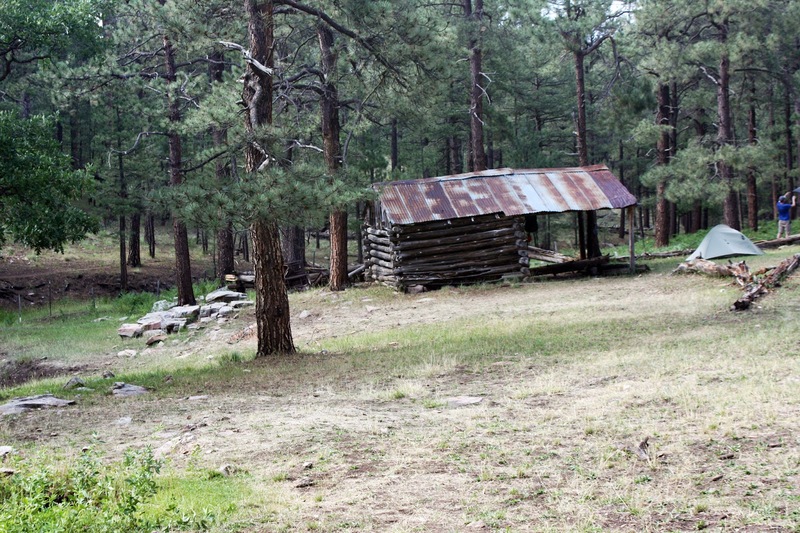 Yet another underrated piece of AZT. Photo by Arturo. It's a jungle out there! Photo by Arturo. Cooling off at the Blue Ridge Campground. Photo by Tim. The final four at Blue Ridge Campround. Photo by Tim. The final stretch of singletrack to AZ87. Photo by Arturo. Somehow we managed to stay dry all day except for one short light shower, prompting us to don our raingear for 15 minutes. 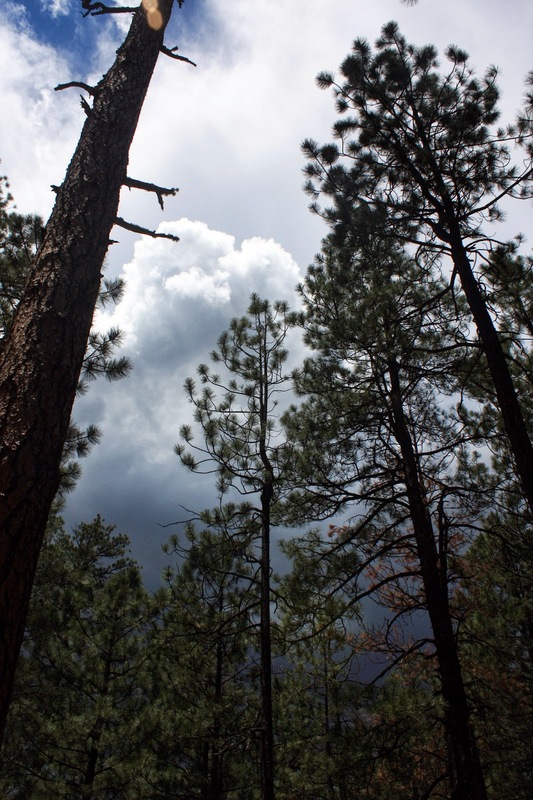 Riding through the forest to the distant thunderous rumblings has an almost surreal feel to it. 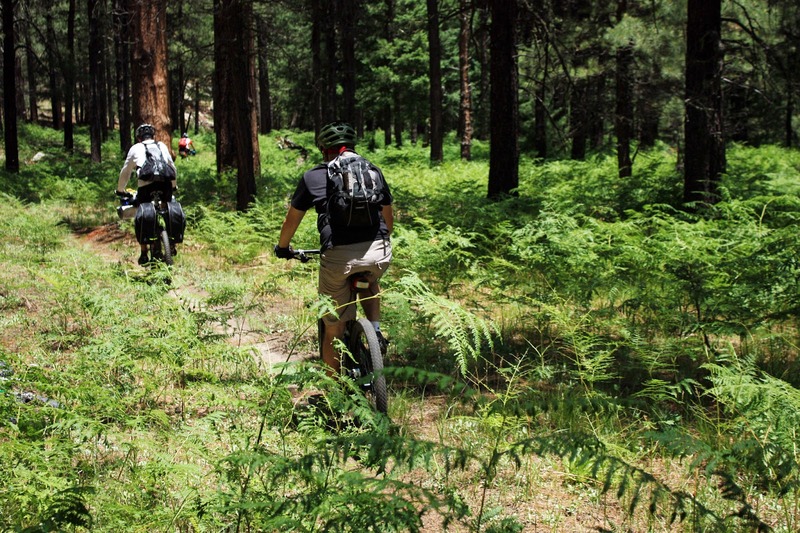 Knowing the not-to-distant trail is scolded by Mother Nature while we ride on unaffected. 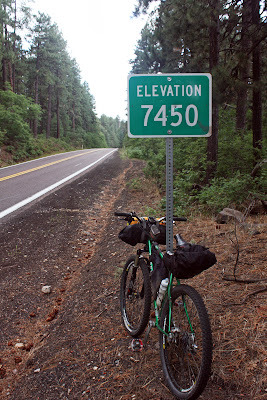 I was trying to give my best guesstimate of how far the pavement ride on AZ87 was back to FR300. I thought it was in the neighborhood of 8 miles, when in fact it was 9 miles just to Clint's Well, then another 8 or so miles to FR300. I was feeling good and settled into a nice rhythm on the pavement. 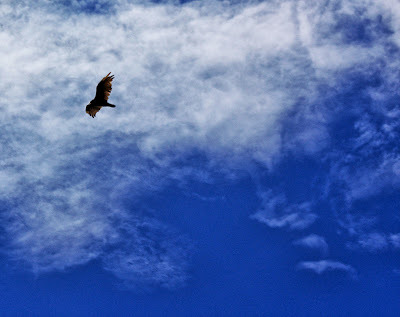 At the top of the first climb I found myself alone, a quick glimpse to the sky told me to keep moving. At the Clint's Well gas station. About a mile to go here with a light rain beginning to fall. No worse for wear after another fun trip. I stopped at the gas station in Clint's Well where the attendant told me the store lost power after being struck by lightning earlier in the day. I picked up a chocolate milk & Pepsi and looked down the road for signs of the others. A few minutes passed and I decided to keep moving to stay ahead of the storm. A second rather stout climb greeted me a few miles down the road I was grinding it out near the top when a pickup truck whizzed by with Arturo in the back!! He looked really drained, I yelled out to him, but he was gone. A few minutes later he appeared, back in his car, heading back down the road to pick up Ashley & Tim. I finished out the ride, changed, and a few minutes later the gang showed up. 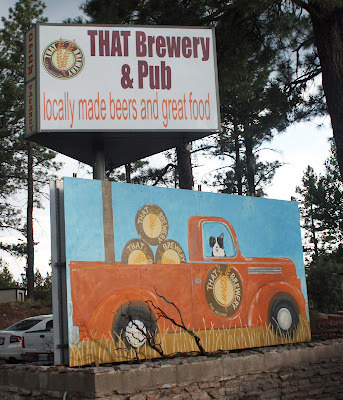 The four of us made a quick sprint down off the rim to Pine for some grub at That Brewery. I finally was able to try out the Arizona Trail Ale, pretty good stuff. 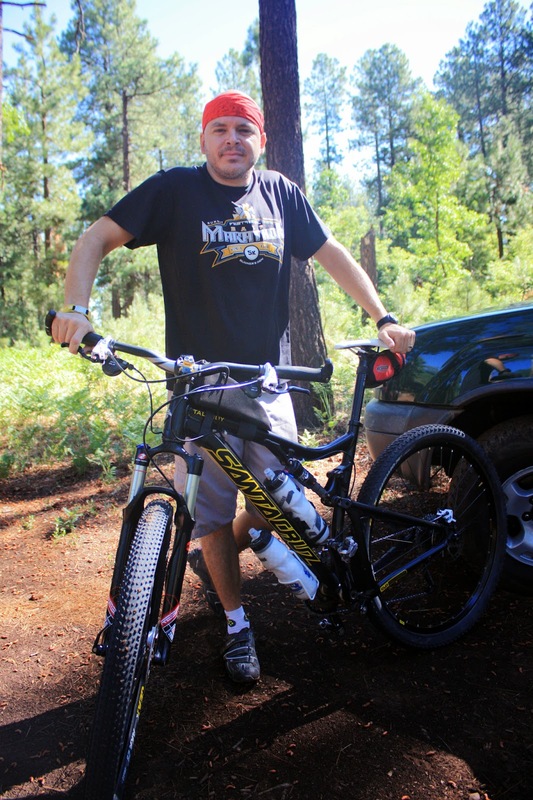 A portion of proceeds go back to the AZT, how cool is that!! 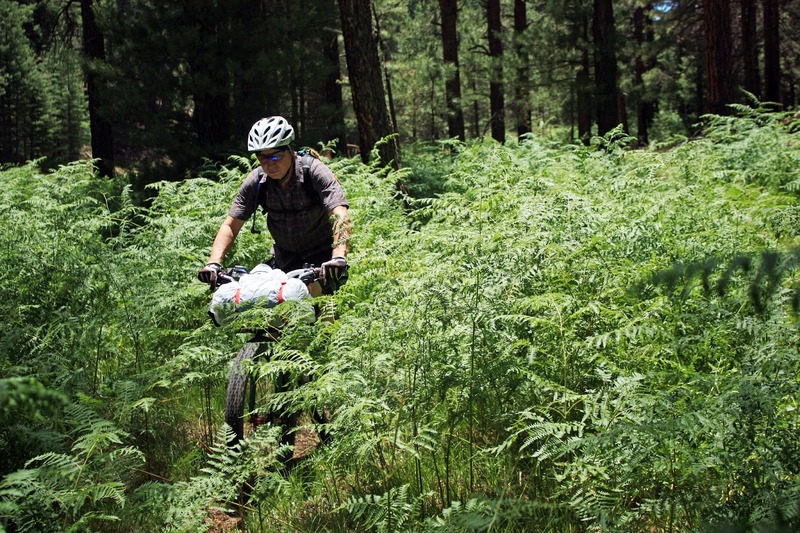 Drink a beer, get some trail. Another great outing in the books. Photo by Tim. This was such a fun weekend, I'm planning a second one!! From the post-ride chatter, everyone had a blast and the first time bikepackers are hooked! !